Vedas say that before the creation of the universe Lord Vishnu was sleeping in the ocean of all causes. His bed is a giant serpent with thousands of cobra like hoods. While Vishnu is asleep, a lotus sprouts of his navel (note that navel is symbolized as the root of creation!). Inside this lotus, Brahma is born. 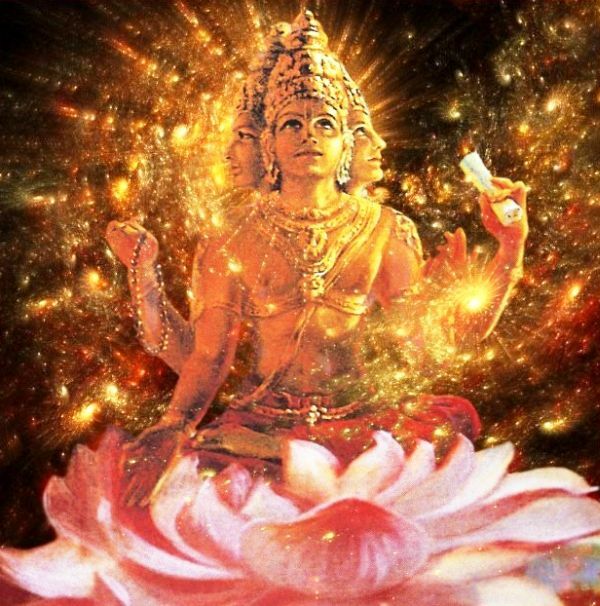 By the way, in the trinity of Creator, Maintainer and Destroyer as mentioned in the Vedas, Lord Vishnu is the maintainer. Brahma is the creator and Shiva the destroyer. And each Brahma has a life span of 100 years (in which each Kalpa is half a day, i.e either day or night) and at the end of which even he ceases to exist giving way to his successor- a new Brahma. The present Brahma is seventh in order as six Brahmas have already passed. The name of the first Brahma – Virinchi. The name of the second Brahma – Padmabhu. The name of the third Brahma – Swayambhu. The name of the fourth Brahma – Parmeshthi. The name of the sixth Brahma – Hemagarbha. The name of the seventh Brahma – Shatanand(present brahma). Next(eighth) Brahma (creator) will be named as Chaturmukha. Ninth Brahma will be Hanuman. Each year of Brahma has 360 days and we’re in the first day of the 51st year of our current Brahma. Vedas say that during the day Brahma is busy in creation of life and during the night all life he created is absorbed back into him! So we will be there only for this day of Brahma, which is the first day of his 51st year. And, what does this day of Brahma means? Each Kalpa(day) will have have 14 Manvantaras. Creation happens only during these 14 Udaya Kalpas and he rests during 14 Kshaya Kalpas (his nights). Right now we’re going through Sweta Varaha Kalpa and Vaivasvata Manvantara. Earlier to that 6 Manvantaras, ruled by 6 manus have passed. As per vedas 1 Manvantara = 71 Mahayugas. 1 Mahayuga = 1 Sat(Krita) Yuga(40%) + 1 Treta Yuga(30%) + 1 Dwapara Yuga(20%) + 1 Kali Yuga(10%). Now, Kali Yuga is defined to last for 432,000 solar years. Based on that, Dwapara Yuga lasted for 864,000 years, Treta Yuga lasted for 1,296,000 years, Sat Yuga lasted for 1,728,000 years. Total Maha Yuga span now is : 4,320,000 years. So each Manvantara = 4,320,000 x 71 = 306,720,000 years. 6 Manvantaras have passed so far, so 6 x 306,720,000 = 1,840,320,000 years have passed in past manvantaras. So far 27 Mahayugas have passed in present(7th) Vaivasvata Manvantara. 27 x 4,320,000 = 116,640,000 years. In 28th Mahayuga (running presently), 1 Krita (Sat) Yuga, 1 Treta Yuga, 1 Dwapara Yuga and Kaliyuga’s 5112 years have passed so far. So add 1,840,320,000 + 116,640,000 + 1,728,000 + 1,296,000 + 864,000 + 5112 = 1,960,853,112 years. These many years have passed in present year (51st) of Brahma. Before that 50 years have passed for him. That is : 50 x 360(days/kalpas) x 28 (Manvantaras) x 71 (Mahayugas) x 4,320,000 (each maha yuga span years) = 154,586,880,000,000 years. Add 1,960,853,112 years to it and its about 155 Billion years. Modern day Scientists have discovered that our present universe is approximately 155 billion years !!!!!!!! !